Built by Vaagen Verft in Norway in 1975, the Arctic Sunrise was originally christened as the sealer, PolarbjØrn. The 1A1 icebreaker, (the second highest classification at the time of her construction), had a double enforced hull, making her ideal for fighting her way through sea ice during the sealing season. In 1995 her owners, GC Reiber Shipping, put her up for sale. Greenpeace approached the company to purchase the vessel but was immediately turned down. 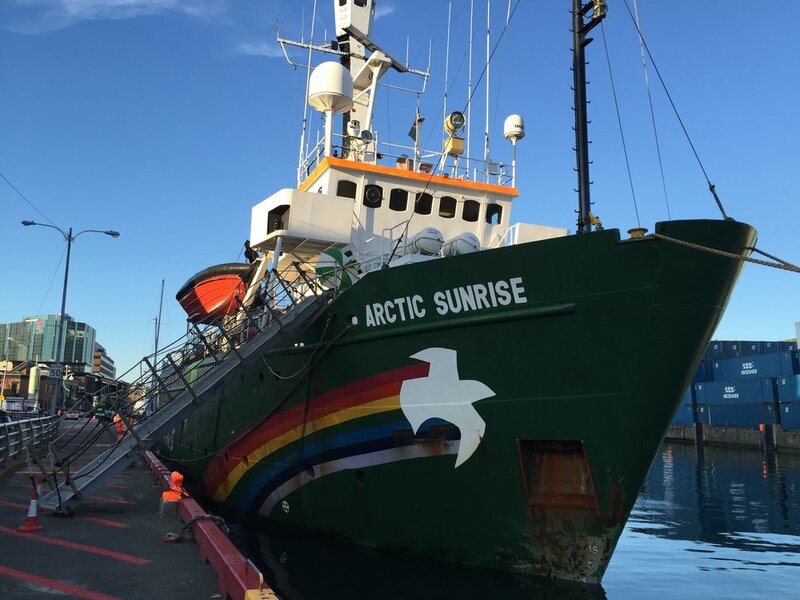 Instead of seeking out another vessel, Greenpeace created a shell corporation, purchased the vessel and renamed her the M/V Arctic Sunrise. Since then, she has operated in ecological research campaigns around the world, and as Greenpeace’s flagship for some of their more controversial activism. On Thursday, August 4th, I headed down to the harbour to check the ship out and see if I could talk to anyone about why she was in town. Ships like Arctic Sunrise aren’t that common in St. John’s, as you might imagine, so I figured there had to be a pretty good reason why she'd made this a port of call. Once I arrived alongside the ship, I took some photos and finally managed to flag down one of the members of Greenpeace on board, a delightful woman named Farrah. She was more than happy to answer my questions about Arctic Sunrise’s current campaign. According to Farrah, Greenpeace is participating in a partnership with a community on Baffin Island. They had purchased solar panels that were being stored in St. John’s, and once those were loaded on board they would be sailing up to the community to deliver and help install them. In the meantime, they were waiting for three members of the community to fly into St. John’s and join the vessel so that they could sail up as one group. She spoke very excitedly about the work that they were planning to do, and I was really happy to have the opportunity to chat with her. Unfortunately, I arrived in the evening after the crew had gone ashore for their time off, so there was no one around to answer my more ship-specific questions. Farrah recommended I come back the next day when someone would be around. Of course, I did. Friday afternoon around lunchtime, I arrived back at the Arctic Sunrise. After waiting for a few minutes, a crew member was found and invited me aboard to show me around (which was, honestly, both surprising and great!). One of the first things that struck me when I first saw the Arctic Sunrise was how high her crow’s nest sat above her bridge. This, I was told, was due to her status as an icebreaker. The high vantage point was particularly useful when the ship was navigating through ice fields, because it provided whichever (un)lucky crew member was on duty with the best view for spotting a clear path through the ice, and out to open water. The ship even had remote capabilities, so a mate or the captain can steer the vessel from the crow’s nest, rather than from the bridge. In addition, the hull is so resilient against the ice that if she does get caught in a jam, the crew can affix mooring lines to the ice and wait until the current shifts and frees the ship again. The other thing that Arctic Sunrise has going for her is her shallow draught. At just over 5 metres, she is able to sail into areas that other vessels can’t access. In case the cove or inlet they are trying to navigate has not been well charted, they’ve come prepared; their RHIB’s are equipped with sounding equipment, allowing them to run ahead of the ship and figure out the safest course for her to travel. This is particularly helpful when venturing into fjords and similar areas to observe the wildlife. The ships narrow body also makes her highly manoeuvrable, which is perfect when she’s navigating behind the smaller boats, or through the ice. During my visit, some of the crew was receiving helicopter training, so I wasn’t able to get up to the bridge. The Arctic Sunrise is equipped with a fully operational helipad on her stern, and for campaigns like the one on Baffin Island, a helicopter is sometimes the best way to get people and supplies ashore. When they’re at sea for an extended period of time, the cargo doors (that I was standing on at the time) open up, a platform raises, and the helicopter can then be moved and lowered into the cargo hold until it’s needed again. The training the crew was receiving was to be able to safely direct the helicopter pilot during takeoff and landing aboard the vessel. I was then given a quick tour of the inside of the ship. The cargo bay was serving as a common space, and off of that were cabins and the onboard clinic. They also had a galley, a large mess, and a sauna on board. Unfortunately, due to time constraints, I wasn't able to get any photographs of the interior. At the time of writing this, Arctic Sunrise is currently anchored in Clyde River, Nunavut, on the shores of Baffin Island. I wish her crew best of luck on their project with the community, and I hope to someday see them back in St. John’s!